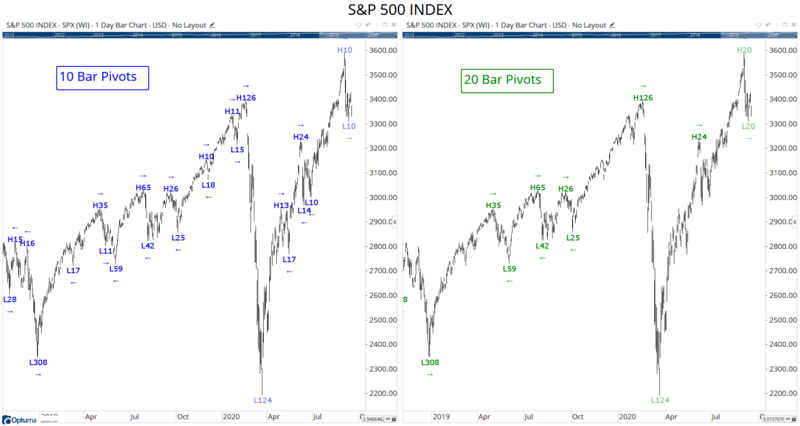 As you may know, Optuma has various tools to help identify significant turning points, such as the various swing overlays (including Gann, percent, or and volatility swings) but one tool I’ve started to use more and more is the Pivot Label tool. You can read more about the tool here, but basically it labels high and low turns based on the number of bars either side, so the higher the number the more significant the turn. In the example for oil below, the Pivot Labels on the left have been set to 10, which means that there must be at least a 10 bar interval before or after until another bar can cross the same high or low price (in this case I used daily bars, but they work the same in any timeframe). Compare that to the 20 bar pivot on the right which will obviously show fewer – but more significant – turns as the interval required is higher. Note: you can change the chart or scan timeframe to weekly to make the turns more significant. 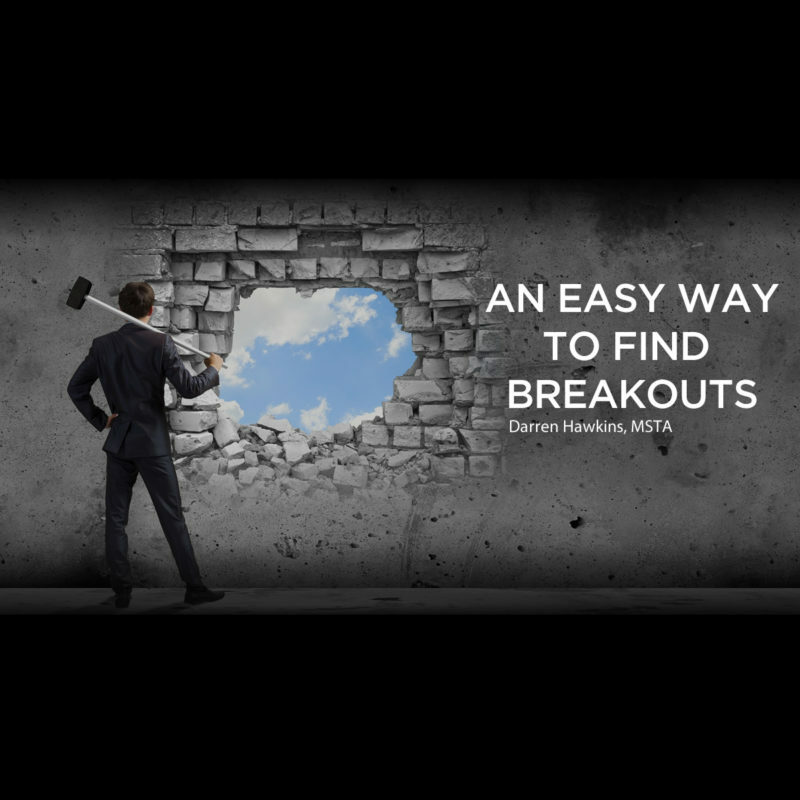 In this article I want to show you how to create a scan to identify breakouts from these support and resistance levels and save those results as a watchlist in a workbook, so that every time the workbook is opened the scan will be automatically executed and the list updated – a great timesaver! If we know the last pivot value then we can create a scan to alert us when that level has been breached, thus signifying a potential breakout that might be a great trading opportunity. 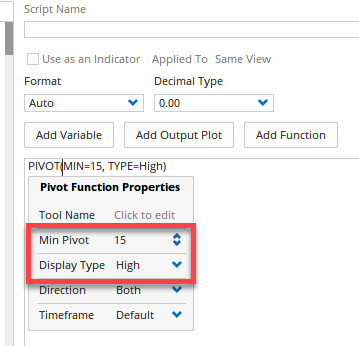 In the scripting language we can use the PIVOT() function to calculate these levels. In this example of $DIS, the last 15 bar high pivot was at $115.50 (which was in fact the highest high in 54 bars), as calculated in the watchlist. Here’s an example of the scan results, showing $DRI finally breaking above November’s strong resistance when it failed several times to get above $114.46. I also added a % of 20D Avg Vol column to show the if there was strong volume associated with the breakout. In the case of $DRI the volume was almost 3 times the 20 day average. 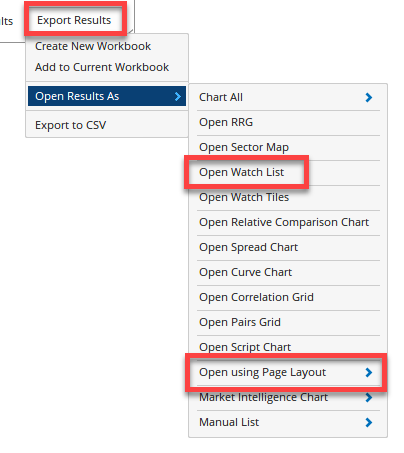 Because the watchlist is linked to the scan, when you open the workbook tomorrow (once the end-of-day data has been downloaded) the list will automatically update with the new breakouts. This means you can have a workbook containing a series of page tabs linked to scans, so as you click on the tab the stocks with a true result will populate the watchlist. Enterprise Services clients can set up command line prompts in the Windows Task Scheduler, which will automatically run the scans at a time of your choosing. 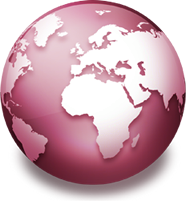 The results will be automatically exported as either images, a PDF, a .csv list of symbols, or even an email (Microsoft Outlook clients only). If you have any questions or need more help with creating custom scans or formulas please post on the scripting forum. 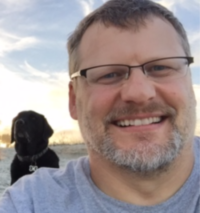 Make sure you search the forum first to see if your question has already been answered, but if you need more advanced help then one-on-one consulting sessions are also available. Great work Darren! – this is something I’ve been trying to code for a while after reading more about chaos theory and fractal breaks by Bill Williams (he uses 4 bar fractals). My results were ok-ish – I wanted to see if you had any thoughts on the code I used or how a Donchian channel might also be used to add a time layer to pivot breakouts. Great work Darren! – this is one of the things I’ve been trying to code for a while based on my reading of the chaos theory and fractal breaks strategy by Bill Williams – he uses 4 bars on each side. The results are pretty impressive on the signal tester on a basket of FX pairs I trade: 63% probability, win-loss 2.5:1 when I combine with a trend filter and a momentum indicator. Just a query: the turtle trading system uses a similar approach using new highs with a Donchian channel. How could I validate this – I used the code close() Crossesabove Donch() and close() > Donch(centre line) but the results were not as good.